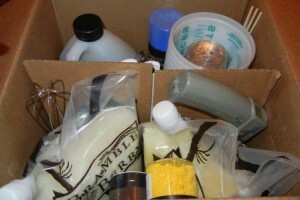 Kim Blogs from the Soap Guild Conference! Erik and Kat Get Swirly! 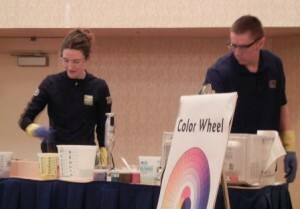 Wednesday, Erik and Kat from Otion stepped in as the Soap Queen at the annual Handcrafted Soapmakers Guild conference in Miami. Kat did back-to-back sessions demonstrating in-the-pot and linear swirling techniques to eager soapers. Erik was her right-hand man. Supplies for great swirls. Oxides, Micas, Fixed Oils and Fragrance Oils from Bramble Berry. Check out those skewers in the corner of the box. Tools of the trade! Kat explains how to get nice swirls while Erik assists. Tip: Use a spatula to pull colors in opposite directions and make sure the spatula is touching the bottom of the mold. For a more detailed swirl, use a reed or skewer to pull the colors in a figure-eight or circular pattern. 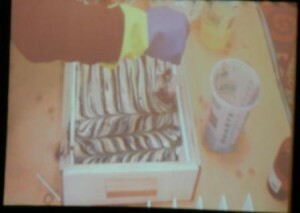 First, the in-the-pot swirl in a Log Mold. This soap features 4 colors plus the natural soap for a total of 5 colors. Then, linear swirling in an 18 Bar Birch Mold. It’s 3 colors plus the natural soap for a total of 4 colors. If you’ve ever taken a class from Kat, you know she’s a natural at teaching. The sessions were really well done. Great job, Erik and Kat! I had such a fun time, thank you for coming to the class! @Stephanie: I do put fragrance in each color and I always, always check up on my synthetic scents to see how they behave in CP before attempting a swirl. Some soapers will add scent in the beginning, but I like to hand stir it in to each section of soap batter (including each colored portion) at the very end before pouring. That way, if by any chance the soap accelerates, at least I have already incorporated my color and I can get that soap in the molds ASAP. If you ever want to come up to Bellingham, I teach the same advanced swirling class from the conference at least once a month! I was there and yes, the demo was amazing! I made a midnight batch with EOs, which I don’t usually color. However since my EOs seem lately to work better than my FOs, I figured that I would try it out and I made my most beautiful swirl ever! Had to wake up hubby to show him! LOL! Now, I need to figure out why my FOs are not working out as they use to. How long is the shelf life of a FO? I think that I need new ones. Are all your FO Phalaphate free? Also, can I put poly 80 in soap? I have it in the past in creams to get the water and oils work better, so would it work in soap too??? If so, I need to get some. I believe that it is not harmful at all? We recommend that you use a fragrance oil within one year. Not that it will go bad after that – it usually just starts to lose its scent. Some fragrances speed up trace and some don’t, we put our testing notes on each fragrance we sell but you might have different results with your recipe and soaping technique. So it’s always a great idea to keep a soaping journal so you can record the recipes you try and their results. Most of our fragrances are phthalate free but some of the older ones are not. If you email customer service they can provide a list for you. I wouldn’t recommend adding Polysorbate 80 to your soap – there’s just no reason to. If you are having troubles with your soap separating or your fragrances weeping that is usually a result of not mixing enough before you pour your soap batter. I bet that was a great demo to see in person! Beautiful! The soap that Kat made for the soap swap is just gorgeous! I keep picking it up to feel of it and trace the lines of color in it. Do you put FO in each color? I have tried and it gets thick by the time I have to add each color. The FO also makes it thicker. However, if I don’t put FO in the color, it works. I can swirl many more colors. There are many different swirling techniques. 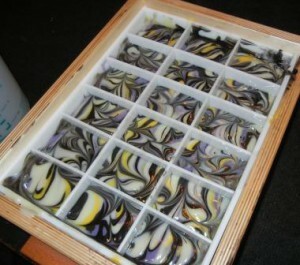 Most will scent the entire batch and then separate it out to make different colors for swirling. If you use this technique you’ll definitely want to use a fragrance oil that gives you a lot of time to work with the soap batter.